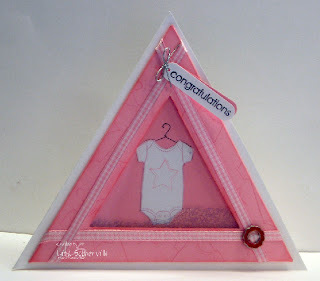 It's week 37 of the Bloggers Challenge and this weeks challenge was to create a shaped card - anything but a rectangle. I turned to the December `06 TJNL's online bonus - Triangle Shaker Cards to create my shape. To ad some color to my Styled Silver Hodgepodge Hardware, I mixed some Pretty in Pink reinker with Crystal Effects and filled in the well of the hardware. If you'd like to play along with this weeks Bloggers Challenge, leave a link on this post to your "anything but a rectangle" card. If you upload to SCS, use keyword BCW37, so it's easy to find. Have a great weekend! Be sure to check back next week, I'll be celebrating my birthday all week, thanks to some generous sponsors! Oh my word! A triangle! So sweet and cute! Love the ribbon details! WOW, adorable card, love that ribbon slide. Very sweet. OMG! That is so cute! Love the colors - I'm a sucker for anything pink! Maybe because I have 4 daughters?! Ha! 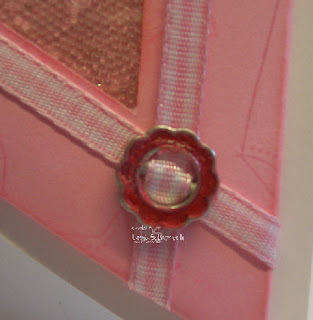 Loved how you used the ribbon slides, and the idea to make it a shaker card. Great job! Really cute, Lisa, and great idea for the hardware! I love the triangle Lisa! And that flower ribbon slide...colored...love it! Just darling Lisa. I forgot about these triangle shakers. Great colors, layout and details. Love it. This is the best! 1 of these days I gotta try this shaker, love this sheet! Oh my goodness...this is the sweetest thing! Fantastic details, too! Oh this is really wonderful. I love that you colored your ribbon slider...very creative. And...this is the first triangular card I've seen. Awesome job there, girlie! Adorable card! Love the little slide too!! Love, love it! Great idea for the hardware too. I've never seen a triangle shaker card...this is SUPER CUTE!!! GREAT card - I love how you've used the ribbon on it... and of course the colored ribbon slide "rocks"! Great card as usual Lisa. Don't you just LOVE this set? And what you did with the slide is Rockin! Excellent job! So sweet!!! Love that onesie!!! Neat! I love the Triangular shape of your card. The ribbon slide is perfect. I saw a tutorial somewhere about doing that. It's a perfect touch. Great card Lisa! I love what you did with the ribbon charm! Lisa, I LOVE your card! The shape really frames the onesie and love the detail on the hardware! I need to try this out soon! Your card is fantastic--I love that it's a shaker card too! This is absolutely adorable and I think I have a thing for triangle cards -- the ones I have seen have been adorable!!! This is such a fun variation on the shaker card! Thanks for sharing how you colored the ribbon slide. Great card. It looks like a shadowbox. Love the details on the ribbon slider. Great job!